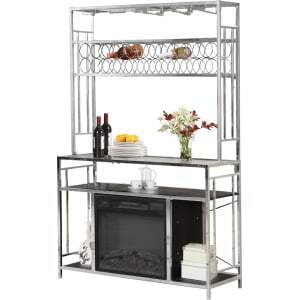 Bar with Fireplace - Metal - Silver - Home Source Industries from Target. hanging stemware, this home bar storage solution provides an attractive way to store your wine collection as well as a convenient surface for pouring glasses or dishing up appetizers. With the addition of a cozy electric fireplace, this piece will make your living or dining room one of the best wine bars in town. Color: Silver.